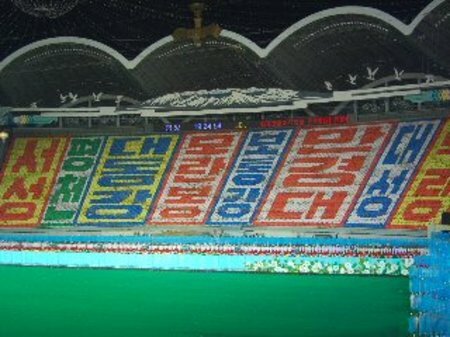 Mass games, Pyongyang. Photo: Lawrence Hudson. 1984 was one of the first novels I read that really grabbed me: I hit it at just the right age and at just the right time of year – a quiet teenager holding the book in a blowy spring that was full of bright cold days and people buttoned down into their coats, with pale, fluorescent-light skin. Ever since finishing it, stories about mad, crazy despotic regimes have always interested me – both for the tales of the audacious lunatics who usually run the show, and also for the insights of what it’s like for people to live in a country run by leaders who consult astrologers, spend all the cash on gold plated palaces and think nothing of training thousands of school kids to display coloured placards in sync so you can spell out your name. No discussion of bleak, barmy regimes would be complete without a mention of North Korea, a place which my friend Lawrence recently went to as part of his travels in Asia. He’s posted about the trip, on his blog, here. Meanwhile, Burma has been in the news more recently: the Times had a good piece up on Naypyidaw, the random, completely new capital the Junta recently constructed. Also worth reading is a blogger’s take on his trip to the new Burmese captial, complete with pictures.